As a general rule, I don't do eggs for breakfast unless they are either soft-boiled or eggs over medium. Omelettes for me feel heavy in comparison and scrambled eggs are the least exciting. Blue Dahlia Bistro is most well-known for it's frittatas, so of course I had to make an egg-seption (yes, I did just go there) and try it at least once. 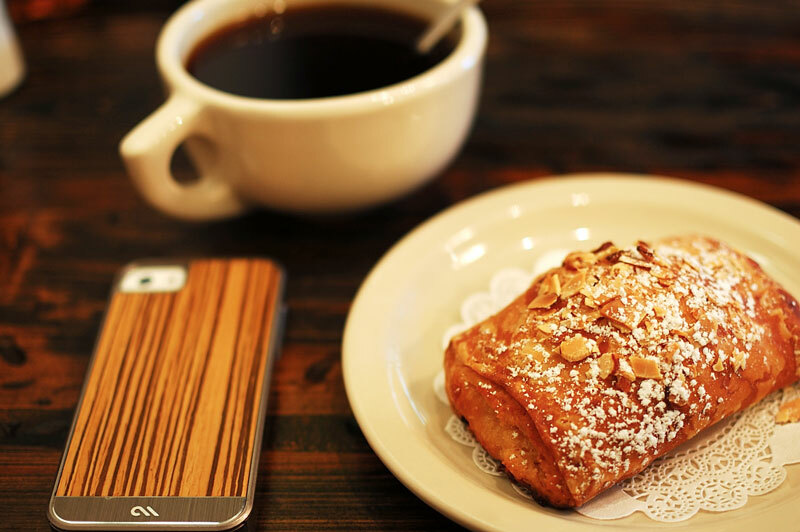 I started off my breakfast with a cup of Austin Kohaha coffee and an almond marscapone croissant. The Austin Kohaha coffee was very large! I added in my normal 2-3 tablespoons of honey, which made it just right for me. The croissant was the highlight of my breakfast. It was so incredibly creamy on the inside, and it was of light flakiness on the outside. Honestly, I considered ordering two of these and would have done so if I didn't also order the frittata. The frittata. Let's talk about the mushroom spinach frittata! It came out much larger than expected– I'm not sure what I expected, but it was certainly large enough to share with a friend. The frittata was soft and moist... not much different than a cake, which of course it's modeled after. In the cross section, there are generous helpings of mushrooms, spinach, shallots, and mozza on the inside. The mushrooms and spinach stood out the most to me in terms of taste. The accompanying pesto really complemented the frittata; if not for the pesto, it may have been a tad too eggy for me. Overall, I enjoyed it a lot and would recommend anyone stopping by Blue Dahlia to get one of their daily frittatas a try! Now, here's little price history and personal insight on Blue Dahlia's frittata. It's likely the most popular item on the menus as all the tables surrounding me also had at least one order of the frittata. Interestingly, a little research on the internet would show the drastic price changes in the menu, especially regarding the frittata. In 2009, a frittata at Blue Dahlia cost about $5.25. In 2012, it increased to around $7.95. Fast forward to 2014, which is when I paid $9.25 for my frittata. While that is about a 75% increase in price over the last 5 years, I want to inject my personal opinion that I don't think the current frittata is overpriced at all. $9 buys you what is indubitably a full meal. I honestly barely made it through half of it before becoming satiated. What blows my mind is thinking that a frittata of that size for $5.25 is an AMAZING deal that I sadly missed out on.